Pieces of history from an old St. Paul brick-and-mortar store are up for grabs starting this week. Developers heading the conversion of the former Woolworth five-and-dime store in downtown St. Paul are giving away bricks from the building. 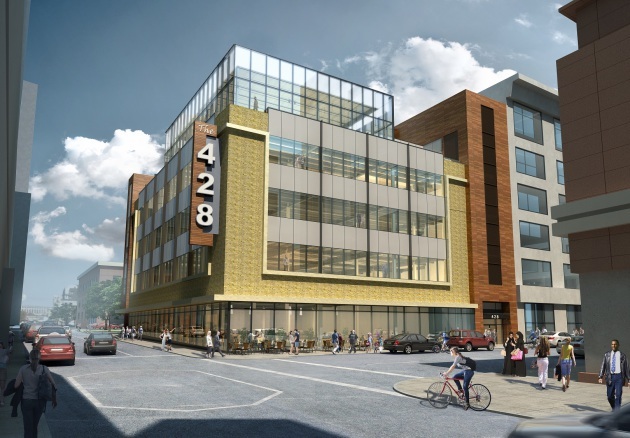 The old store, which has sat vacant at Minnesota Street and 7th Place E. since 1994, is being turned into a modern office building called the 428 that will include an outdoor patio and co-working space. A large priority for the redo of the complex was to help bring light into the formerly dark space so there will be walls of windows that dominate all four floors meaning the current exterior brick needs to be removed. “In order to preserve the history of this landmark, we would like to giveaway the brick that is being removed to members of the community that are looking to hold on to a piece of St. Paul history,” according to the announcement by Commercial Real Estate Services, Inc. The redevelopment is scheduled to be finished by next summer. Wednesday, July 12th, 2 pm to 4:30 pm; Thursday, July 13th, 2 pm to 4:30 pm; Tuesday, July 18th, 2 pm to 4:30; Thursday, July 20th, 2 pm to 4:30 pm.